(EDWARDSVILLE, Ill.) When asked to apply for a national award recognizing the tracking of student learning outcomes in education, Bryce Sullivan, an associate professor of Psychology and chair of that department at Southern Illinois University Edwardsville, said he was up for the challenge. Last December, Sullivan was approached by Sue Thomas of the SIUE Office of the Provost and asked to put together a package that would showcase the department's commitment to quality education, and highlight what students' garnered from their studies at the University. A required capstone experience for all graduating seniors was where Sullivan looked to find what was needed. The Psychology faculty's commitment to mentoring of students, the department's ongoing assessment of student progress, and his unconventional method of submitting the materials to the Council of Higher Education Accreditation (CHEA) led to a national award. SIUE was recipient of one of only four Awards for Institutional Progress in Student Learning Outcomes given across the country, vying with 32 academic institutions of higher learning to submit applications. "We've done a lot of good work in our senior assignment program over the years," Sullivan said. "It really highlights the integration of teaching and research." Thomas praised the department's work in the area of senior assignment. "The CHEA award represents exactly the kind of national recognition SIUE deserves-recognition for cutting-edge programs with informed, effective teaching that result in demonstrable student learning," Thomas said. "It is important to note that the Psychology Department's success did not happen overnight, but is the result of years of dedication by the University and the department to establish and support practices that produce effective student learning." Sullivan may have boosted the department's chances by using the Internet to submit the award application packet. Along with the required submission documents, Sullivan created a Web page (www.siue.edu/PSYCHOLOGY) to showcase the outcome assessment information that was collected on student learning within his department and the University. "Although the Web site may have helped, the true reason for receiving the award is the outstanding and dedicated work of our faculty," Sullivan said. According to CHEA, the awards were introduced this year to recognize and encourage institutions to use new, innovative systems as ways to evaluate and determine student outcomes. In choosing award recipients, a committee assembled from across the country assessed how accessible the information is to the public and based its decision on four criteria: a) Articulating and providing evidence of outcomes; b) Providing evidence of success with regard to outcomes; c) Informing the public about outcomes; d) and using outcomes for institutional improvement. 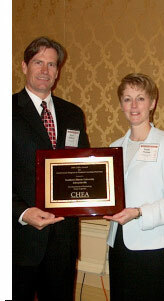 CHEA is the largest institutional higher education membership organization in the nation, with 3,000 degree-granting colleges and universities. "The ability to define and demonstrate success in higher education is a critical factor in raising the overall standards of educational quality," said CHEA President Judith Eaton. Sullivan added, "At SIUE, the senior capstone is designed to show our students learn what they need to know, while meeting the expectations faculty have for them in terms of learning outcomes. "The University's senior capstone experience is one of the ways SIUE is recognized as a premier metropolitan university and this award is a concrete example of this national recognition."